USB drives are now very common among college students and office going professionals . Sometimes they would contain sensitive informations and files that is to be protected from others .Rohos mini drive 1.3 is a freeware application that can create a protected /encrypted partition in a USB drives . The special about Rohos mini drive is that we don’t need any program to open the password protected USB drive from an other machine where Roho is not installed . The non password protected files will remain intact and a special partition called Roho disk will contain the protected files. Download Rohos mini drive 1.3 and protect USB drive with password . 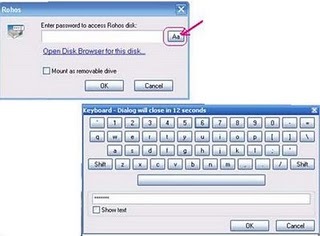 How to use Roho to protect USB drive with password . Open Roho mini drive software . Roho will detect any USB drive connected to your computer . Click on set up USB key and enter the password to be used . New zoho disk will be created to which you can transfer the files that are to be protected . Similar icon will be displayed on a Roho disk , when accessed from a different machine . 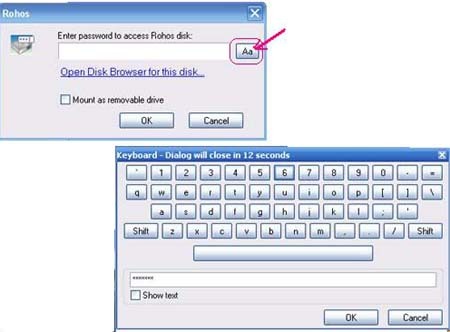 Enter your password using Rohos Disk Virtual Keyboard . Now you would be able to access your password protected USB drive files . Download Roho mini disk 1.3 and protect USB drive with password . See also : Block USB on a computer . : Remove autorun worm from USB .